Waterside Health & Beauty offer a full range of treatments from all the biggest names in the business. We use the fabulous French brand Guinot, the very popular Jessica Nail care system (including the very latest offering of GELeration Nails), Bodyography from America, and last but definitely not least, St Tropez Spray Tans. Check out all our treatments below. If you would like to book an appointment, call us on 01455 291095. 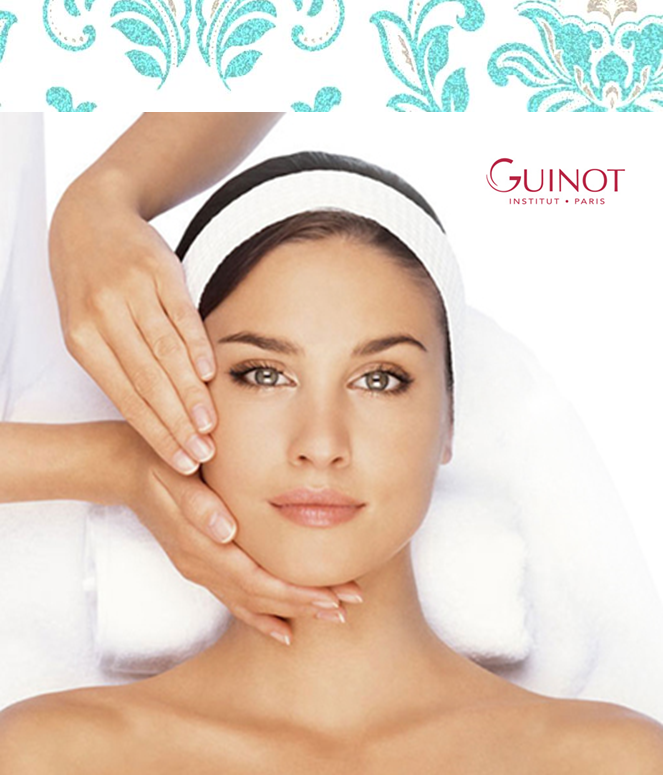 The ideal introduction to Guinot treatments—this facial includes gentle cleansing, toning and exfoliation, followed by rejuvenating massage, mask and moisturise. Relax and unwind with a tension-reducing massage and a customised combination of plant extracts and essential oils to suit your skin’s needs. This utterly relaxing aromatherapy facial balances the skin, softens fine lines, restores radiance, lifts your senses and instills an overall feeling of well-being. Fruit-infused Beauté Neuve is a gentle double-peeling facial that uses the powerful natural exfoliating properties of AHAs, combined with pure vitaminC, and anti-ageing ingredients to boost radiance, reduce pigmentation and re-hydrate and regenerate the skin. 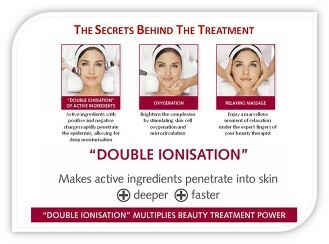 Guinot recommends a course of three treatments, taken over consecutive weeks. The Liftosome facial has been specifically developed to treat the problems associated with mature skins. Based on the use of orange extract, ginseng and collagen, this stimulating thermal facial regenerates and energises, leaving skin firmed and radiant.Guinot recommends a course of two treatments over two successive weeks. The all new, Hydradermie Cellular energy facial. Guinot’s most advanced facial machine to date! A monthly facial for all skin types. Also great for people of all ages concerned about their skin’s beauty & youthful appearance. Real alternative to aesthetic medicine. Hydradermie youth stimulates Cellular energy in the skin for a youthful look. Customisable, this treatment offers 8 options based on the clients objectives ; Anti-ageing, sun preparation/repair, soothing, nourishing, moisturising, purifying & brightening. This treatment is recommended for ladies over the age of 35. The Hydradermie plus facial offers added firming and toning serums to revitalise the skin.With special attention being paid to the eye and neck area also including a pressure point eye massage and a luxurious Serenity Massage with relaxing essential oils. 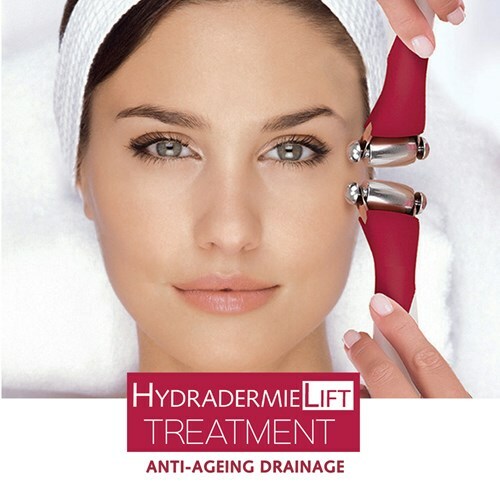 The all new & vastly improved Hydradermie lift facial The Hydradermie Lift is suitable for all skin types and recommended for clients over the age of 30. This specialised anti-ageing treatment gives immediate and long-lasting visible results that improve the skin’s appearance. Designed for skin that shows a loss of elasticity, it treats both the skin and delicate facial muscles for an immediate ‘lift’ and overall boost in radiance. A course of 8 is always recommended when starting this treatment. This ‘work out’ for the face and neck creates a lifting effect in just an hour by toning the complexion, smoothing wrinkles and lifting the facial contours. This version of the treatment specifically targets the area around the eyes to reduce signs of ageing, fatigue and puffiness. This treatment is perfect for that special occasion when your skin needs that extra boost and lift. A complete body exfoliation treatment to eliminate dry, flaky skin and refine the texture of the skin. This slimming treatment uses an anti-cellulite sculpting massage with detoxing essential oils and a clay mask to drain toxins and firm the skin. A complete body exfoliation with a sugar kiwi scrub followed by an energising massage with citrus essential oils. Pure relaxation to leave skin soft and smooth and the body de-stressed. This stress busting, tension relieving massage is specifically designed to reduce tightness of the scalp. It also relieves aches & pains in neck & shoulders. Known as the ‘tan to the stars’ it gives the best and most natural all over tan on the market. I have been using and working with St. Tropez myself now for 7 years and the results are always second to none with it never going orange! With the Ultimate Air Spray Tan it is now even easier and quicker to get a perfect tan! There is also the new ‘Express Tan’ which allows you to shower after a maximum of 3 hours for the perfect St. Tropez golden glow. Jessica is the success story of Jessica Vartoughian.The New York times describe her as “the first lady of nails”. She has created a fantastic natural nail care system which has been brought over from Los Angeles where Jessica still works today. There are so many fabulous colours ranging from pretty pinks to daring reds or even black — something for everyone! Your nails are analysed to get the perfect nail care treatment for you so you can get the nails you have always dreamed of. Includes: nail analysis, hand and arm massage, cuticle work and file and paint. Includes all of the above with the addition of thermal mittens-ideal for dry hands or just a treat! includes: rough skin removal, exfoliation, foot and leg massage, cuticle work and file and paint. Includes all of the above with the addition of thermal botties - great for dry, cracked heels. Please note this is just a natural nail overlay and does not extend the nail. Permanent hair removal using sterex blend or diathermy method. Mii make-up is the ultimate in mineral make-up. Offering outstanding staying power it is ideal for weddings and special occasions. All of the following treatments include: cleans, tone & moisturise. Prices are to be quoted for home weddings. Eyelash extensions the really do last! For every arch, every smile and even the occasional furrow, reveal the true beauty of each expression with brows tailored perfectly to you. 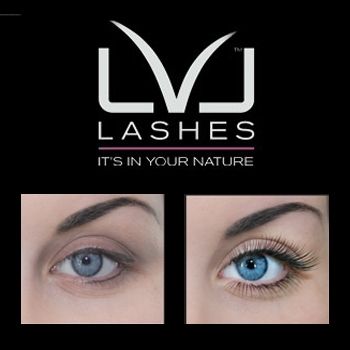 Lvl lashes Lengthen, volumise & lift your own natural lash! You will not be disappointed with this amazing lash treatment. Lasts 6-8 weeks. This also includes tinting the lashes. This treatment takes 1hr £45.00 A patch test is required 48hrs before this treatment.